PAUL CHAPPELL SCHEDULED TO SPEAK IN ROCK & ROLL SOUTHERN BAPTIST CHURCH WITH SLATE OF EVANGELICALS (Friday Church News Notes, February 1, 2019, www.wayoflife.org, fbns@wayoflife.org, 866-295-4143) - Paul Chappell, Pastor of Lancaster Baptist Church of Lancaster, California, and President of West Coast Baptist College, is scheduled to speak in May at the One Nation Under God Conference at the hard-rocking First Baptist Church in Villa Rica, Georgia. (For evidence of their rocking, see the church’s youth ministry video clips.) Other speakers include Todd Starnes (former staff writer for the Southern Baptist Press); Robert Jeffress, Pastor of First Baptist Church of Dallas, Texas (Southern Baptist); Tony Perkins, Southern Baptist and president of the Family Research Council; and Emir Caner, President of the Southern Baptist-affiliated Truett-McConnell University. Pastor Chappell is obviously sensing more liberty these days to be what he has long been, which is a conservative evangelical. This is the type of preachers that he has been producing for some time. God said through the prophet Amos, “Can two walk together, except they be agreed?” (Am. 3:3). This is a truism, which requires the simple answer, “No, when men walk together it is because they are in agreement.” So who is Paul Chappell walking together with? 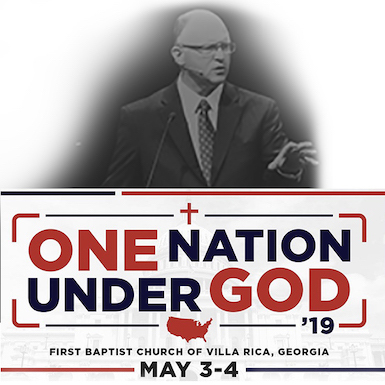 Todd Starnes, Robert Jeffress, Tony Perkins, Emir Caner, and the other speakers at this conference are conservative evangelicals. They are not theological liberals; they are not on any of the radical sides of evangelicalism; they are not Pentecostals; they are not emergents. They are pro-life. They support traditional family values. Politically, they are fiscal conservatives, constitutionalists, pro-military preparedness. They favor the enforcement of immigration laws and border security. But they are not, by any means, biblical separatists, which means that they are bridges to anything and everything religiously. Evangelicalism renounced “separatism” back in the 1950s and 1960s, in Billy Graham’s heyday. Harold Ockenga, who coined the term “neo-evangelicalism” in 1948, said that the chief difference between “neo-evangelicalism and fundamentalism” is “its repudiation of separatism.” That repudiation has become more hardened with each passing decade. Sometimes it seems that the evangelical (even the most “conservative”) has only one thing that he really and truly dislikes, and that is “separatism,” and only one type of preacher that he renounces with any real vigor, and that is the “separatist.” But to repudiate separatism is to repudiate the clear teaching of Scripture, such as 2 Chronicles 19:2; Psalm 119:104, 128; Proverbs 8:13; Amos 5:15; Matthew 7:15; Romans 12:9; 16:17-18; 1 Corinthians 15:33; 2 Corinthians 6:14-18; 10:5; 11:1-4; Ephesians 4:14; 5:11; Colossians 2:8; 1 Thessalonians 5:21; 2 Thessalonians 3:6; 1 Timothy 6:3-5; 2 Timothy 2:16-18; 3:5; Titus 3:10-11; 1 Peter 3:11; 1 John 4:1; and 2 John 8-11. By his own admission, Pastor Chappell has been drinking from the wells of big-tent evangelicals, such as Chuck Swindoll, John Maxwell, Max Lucado, and John Piper, even Peter Drucker, one of the fathers of the emerging church. These are authors on Chappell’s own list of recommended books; not books he reads to critique, but books he reads for profit; not books he reads only in private, but books he recommends publicly on his Ministry 127 blog to influence church leaders (as of the last time I checked, which was January 20, 2019). Another name on Chappell’s list of recommended books is the late Eugene Peterson, one of the most dangerous authors of this generation. And the Peterson book Chappell lists promotes contemplative prayer, which are the most dangerous spiritual waters conceivable. Peterson, author of The Message, is a bridge to anywhere: Romanism, Orthodoxy, the one world church, even female gods (Peterson was a strong recommender of The Shack), universalism, and goddess theology. That is where the author Sue Monk Kidd ended up after beginning to dabble in contemplative prayer when she was a Southern Baptist Sunday School teacher. (See “From Southern Baptist to Goddess Worship” at www.wayoflife.org.) Shame on any man who recommends that God’s people drink from these dangerous waters! FAST DEAD TREE OIL (Friday Church News Notes, February 1, 2019, www.wayoflife.org fbns@wayoflife.org, 866-295-4143) - The following is from CreationMoments.com, Nov. 21, 2017: “Forestry organizations have a major problem with beetles. The Mountain Pine beetle infests many coniferous trees in the Western United States. Apparently 40 million acres of forest have been damaged by these critters. A fungus can get into the tree with the beetle, and this fungus prevents transportation of water and nutrients. The beetle lays its eggs in the bark, and beetle larvae can also cause the tree to die. If this were not bad enough, forestry companies then have the difficulty of disposing of these trees, before they cause further damage from fire. The timber from the trees, however, is likely to be cracked and damaged, and is often stained by the presence of the beetles and fungus. University of Washington scientists have come up with an ingenious solution. The damaged timber can still be used as a fuel. So the UW School of Environmental and Forest Sciences have come up with a way of heating this wood, and other organic materials, at very high temperatures, in the absence of oxygen. This treatment creates a type of fuel oil, which is a dark brown liquid. This fuel has been used in some countries for heating buildings, such as hospitals. Different kinds of oil will have different compositions. While there is not necessarily a close similarity between this wood oil, and petroleum oil, the process at least demonstrates that fuel oils do not take millions of years to form. Similarly, petroleum oils need not have taken millions of years, but could have formed in conditions at the time of the Flood. Ref: ‘More efficient way to make oil from dead trees,’ ScienceDaily, May 2, 2017.